Functional programming is a hot topic in programming and the source of the expressiveness and safety of modern languages like Swift, Scala, and Rust. It also is the foundation for innovative web technologies, such as React, Redux, and Elm. all the recent and upcoming technologies based on it. Haskell is also an amazing language in its own right, known for its high productivity, safety, and agility. 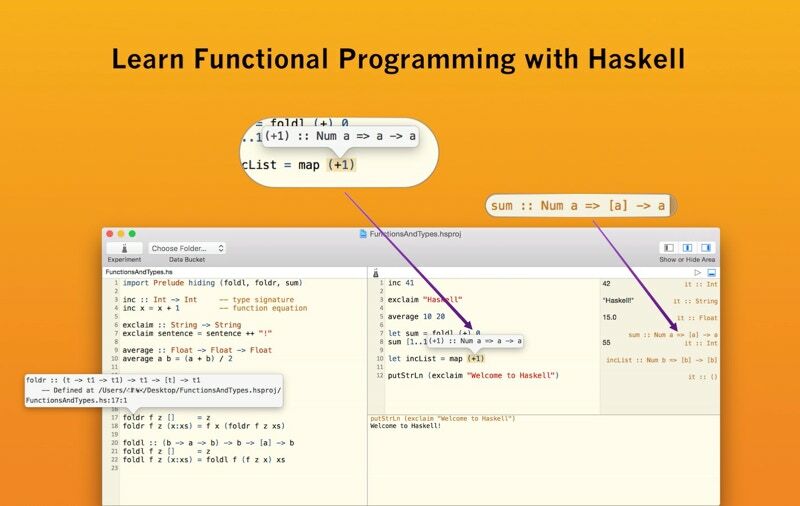 Haskell for Mac is the perfect environment for learning Haskell and functional programming. Haskell for Mac supports prototyping and developing Haskell using live programming. Haskell for Mac integrates Apple’s SpriteKit game engine including animations & physics. Haskell for Mac utilizes macOS’s web engine to preview generated HTML & SVG documents. Haskell for Mac builds on standard tools of the Haskell ecosystem including GHC & LTS Haskell. Apple, the Apple logo, MacBook Pro, Mac and OS X are trademarks of Apple Inc., registered in the U.S. and other countries. Mac App Store is a service mark of Apple Inc.